Birds Eye View view from the deck looking at Neahkahnie Mountain Hot Tub facing the beautiful views Birds Eye View from the back of the house View from street. You can see parking on the concrete slab and then 2 more spots up the asphalt driveway. Spacious living room with beautiful views, furniture, gas fireplace and flat screen TV View from living, dining and kitchen Dining area that is open to the living room and kitchen. Great views from here as well. View from living room into the kitchen. Beautiful kitchen with wood floors throughout and vaulted ceilings. Endless windows in this home. Kitchen has stainless appliances with dishwasher and quartz slab counter tops. King bedroom upstairs with many windows and views of the trees. Master king bathroom with spa like feel. Tile and stone shower. Master king bathroom shower Twin bedroom downstairs Downstairs bunk bed area with beautiful views of the ocean Another view of bunkbeds TV room downstairs with fold out couch for extra sleeping Downstairs full bathroom with shower shared with bunk area and twin bedroom. Downstairs full bathroom with shower shared with bunk area and twin bedroom. Main level deck with ocean views, great outdoor table and gas BBQ. You really feel as if you are in a tree house sitting out on the deck. Mud room with front loading washer and dryer. Beyond this room is the double queen bedroom and access to the lower deck. Another view of mud room Double queen bedroom located downstairs. Beautiful linens. Another view of queen bedroom. It has a flat screen TV, big windows and an attached full bath with tub/shower. Downstairs full bathroom attached to the double queen bedroom. Outside deck with seating and a beautiful view of the ocean. Lower level deck with views, seating and outdoor shower. This deck can be accessed by the bunk bed area. 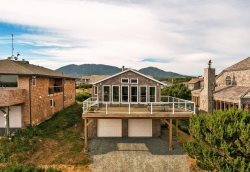 Birds Eye View has amazing 180 degree views of Manzanita Beach, the ocean and Neahkahnie Mountain. This three bedroom, three and a half bath home that sleeps 12 is sure to be a favorite for many. The two levels of ocean view and wrap around decks are a great place to relax in the sun or have a family BBQ on the large deck. The owners have spared no expense with this beautiful 2,300 sq. ft. home located on the south side of Manzanita. Close to the beach, town, golf course and less than a 15 minute walk to Nehalem Bay State Park. The reverse floor plan allows for maximum views. You will notice the fine craftsmanship and high end finishes in this home such as the cedar lined vaulted ceilings, columns and beautiful wood floors throughout. The large picture windows in the living room offer a world class view of an amazing place to watch sunsets, wildlife and much more. Enjoy the flat screen TV, gas fireplace and very comfortable leather couches while sipping your coffee in the morning. The fully stocked kitchen features stainless appliances with beautiful quartz countertops. The dining area has a large table that can seat up to eight with three more at the kitchen bar. Just down the hall from the dining area is a half bath and the master bedroom. This bedroom features a wonderful king bed, a desk, flat screen TV and a walk-in closet. Immerse yourself in the spa-like bathroom with a tile and stone shower, double vanity and plush linens. Down the stairs is a TV room with flat screen, fold out couch, games, puzzles and toys. Across from this living space is an open room with a set of bunk beds. Beyond this, there is a bedroom with two twin beds and a beautiful full bathroom with shower. The laundry/mud room has a front loading washer/dryer and an entrance to the lower deck. Through the laundry room is the last, very spacious bedroom with two queen beds, flat screen TV and attached bath with tub/shower and marble vanity. This bedroom has large picture windows with views of the wooded landscape. Outside, the upper deck features a large family-style table with seating and a gas BBQ. The view of the ocean and trees is spectacular from this deck. You can lounge in the Adirondack chairs and watch the kite boarders on the beach. The lower deck has a warm outdoor shower for clean up after a day on the beach. The hot tub sits on the edge of the hill beyond the lower deck. and is a great place to relax and watch the sunset. Overall, the landscaping is wonderful with cobble stone entrance, tall trees, shrubs and lots of flowers. Bird's Eye View is not pet friendly and does not allow smoking. The home has cable and WiFi. Occupancy limit is twelve. Come and experience a stay at Birds Eye View and relax your worries away. Fully stocked kitchen with 12-cup coffee maker, crock pot, hand mixer, pancake griddle, blender, crab pot etc. You all are very friendly and we love the house and location. Love the big openness of the main living area. It accommodates our group of 7 gals well. People can be watching a movie, cooking, working on a laptop doing something creative all at once and still be together. The staff at Manzanita Beach Getaway Vacation Rentals are helpful, pleasant, knowledgeable, and efficient. We all agreed that the Manzanita house exceeded our expectations. The view from the deck and living room is stupendous, and the proximity to the beach is convenient. We also appreciated the well-appointed kitchen and the comfortable furniture. No issues at all...great overall experience! Love this property! Have rented this home twice now for our annual family vacation to the beach..it's perfect for our family! Beautiful view, and a short stroll to town and beach access is just across the street! Plan to rent this property for future years to come! The property is just as beautiful as advertised. Great amenities and gorgeous view. Very easy walk to the beach and to town. Only thing I would add to the property is more hooks in the master bath for towels and hooks in the mud room (where the laundry is ) to hang rain coats, etc. What an amazing property. Great for the whole family, including kids! Hot tub with a stellar view! Awesome living room views. We had an incredible time in this wonderful house. We will definitely be coming back again someday! Team members were all friendly and provided assistance for all of our needs. Wonderful property and location. Close to town and beach. Great views of the entire beach and mountain area. Decks, hot tub, amenities, etc.... all add up to a great experience! Very easy to work with and very communicative. Perfect vacation in a perfect vacation home. Beautifully furnished with comfortable furniture and beds. Great layout for a large family. Walking distance to town and beach. Danielle was very helpful to explain small difficulties. Very professional. Would love to come back to this home again. Such a well planned place to visit. The service team was readily available, friendly and competent. Glorious! Have locked it in for next year. Such a nice house, clean, and comfortable. We loved the stairs to the beach and great family spaces in and on the decks. This was a great spot for our family vacation. The home has a great layout, particularly on the main floor. Our group included an 11 month old and a 3.5 year old, and we were able to easily spend time together or put the kids downstairs for naps. We loved being so close to both the beach and town, and went to both frequently. The house came equipped with more than enough kitchen accouterments to cover the meals we made (grill was great as well). Overall, we loved it and would gladly come back. The Staff were friendly and so accommodating. Thank you! A few of us met Danielle in 2015 when we were looking for a new property as the one we had used for 10 years was no longer available. She was so friendly and great to personally show us around when we were looking. This place turned out to exceed our expectations. Janet was super helpful when we called during our stay this time with a problem with one of the toilets. So appreciate how you are incredibly responsive when we have had even minor problems (back screen door, toilet, dishwasher). You were so accommodating to let us get in 2 hours early and check out at 1:00. The only thing that would make it better is if you don't have guests on one end or the other if we could get in around noon or stay til maybe 4pm. I think we may have been spoiled by our previous 10 year place. They rarely had guests around the week that we came so they were really flexible on our times. Who knows, you may never get rid of us :) We were talking on the way back about staying a 4th night next year and then one of the gals said "well if we stay 4 we should really stay for 6 and get a second night free". Thanks again for a great stay...already looking forward to next time. It's a stunning home that's still cozy, and it's as though you're nestled in a super deluxe tree house that happens to overlook one of our favorite beaches! Your team was terrific to work with. Very easy to get the information about the house, features, procedures, etc. You've got a top notch team. Lovely! We will be back.